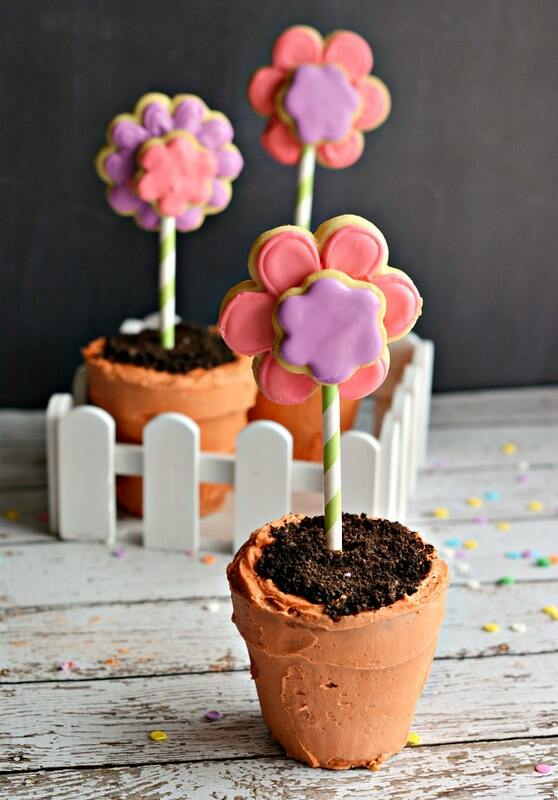 Home » Recipes » Desserts » Flower Pot Cupcakes: So Cute! Flower Pot Cupcakes: So Cute! 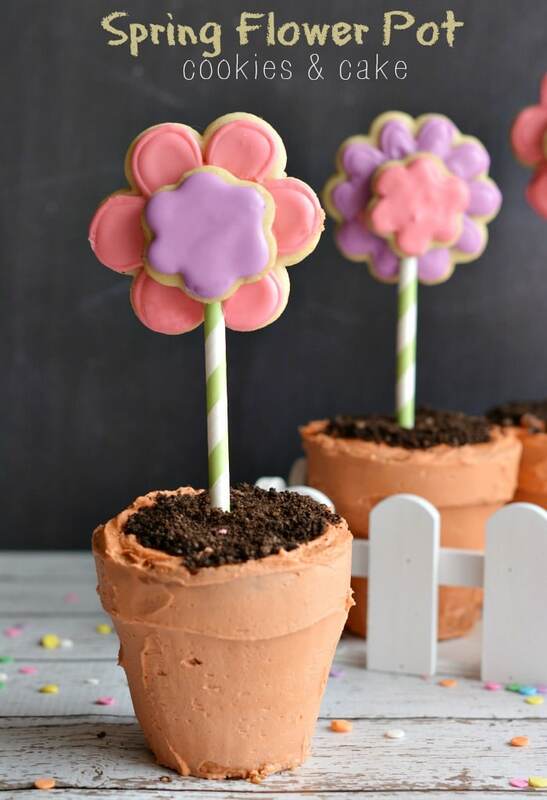 Flower Pot Cupcakes are absolutely adorable! And while this dessert tutorial is great for spring time baking, they can be customized for every part of the year and party. Scroll below to get a printable version of flower pot cupcakes as well to help you bake in the kitchen. To get this project going, you’ll want to start with making cookie pops. These required several hours of refrigeration and drying time. So this would be great for DAY 1 of the project. STEP 1 – Get your supplies together. You’ll need the Wilton Garden Cookie Cutter Set , your favorite cutout sugar cookie recipe and Wilton Parchment paper . STEP 2 – Prepare the sugar cookie dough and refrigerate in plastic wrap for a few hours before rolling. Preheat the oven to 375 degrees F. Use various sizes of the flower cookie cutters to cut the dough. STEP 3 – Place the cookie cutouts on a parchment lined baking sheet , bake until done and cool on a wire rack for an hour. STEP 4 – Once the cookies have cooled, it’s time to frost them. You’ll need Wilton disposable pastry bags and a small round Wilton decorating tip. STEP 5 – You’ll need to make one batch of Wilton’s royal icing recipe, divide it between two bowls and color with Wilton gel color in pink and purple. STEP 6 – Fill a pastry bag with the round tip and a few spoonfuls of purple icing. Outline half the large cookies and half the small cookies. Do the same with the pink icing. STEP 7 – Thin out both icing colors with a little water so it that it flows like honey and pipe it inside the cookie outlines. STEP 8 – Insert a Wilton treat stick inside a green paper straw and trim the straw to the same length as the stick. Press the stick into the center of the large cookie, top with a little extra icing and press the small cookie on top of the stick in the center of the large cookie. STEP 9 – Set the cookies aside to harden for AT LEAST 4 HOURS. Overnight is even better. On DAY 2 of this project, you’ll be baking the cakes, preparing the buttercream and frosting. The buttercream can be done the night before and stored in the fridge to save time. STEP 1 – Gather the supplies you will need including the Wilton Flower Pot Cake Pan , Wilton Bake Easy non-stick spray and your favorite pound cake recipe. For this pan, it’s important you use a sturdy cake like a pound cake! STEP 2 – While you can use the grease and flour method, I prefer the ease of the Wilton Bake Easy spray for coating my pans when I’m baking cakes. It’s super easy to spray on and keeps cakes from sticking to the pan. Go ahead and give your pan a spray and preheat the oven to the needed temperature. STEP 3 – Prepare your pound cake recipe and divide it between the 6 cavities, filling each one just under the bottom rim of the flower pot “lip”, about 2/3 of the way full. Bake as directed. STEP 4 – Cool the pan upright on a wire rack for 5 minutes. STEP 5 – Cover the top of the pan with parchment paper and invert over a wire cooling rack. Leave the pan in place and allow it to cool for 10 minutes. STEP 6 – Carefully lift the pan off the flower pot cakes and allow them to cool to room temperature before frosting. STEP 7 – You can make a homemade buttercream ahead of time and refrigerate, just allow it to come to room temperature before using. For this project, I used Wilton’s buttercream recipe which some people find tricky to make. I assure you, follow this instruction video and you will have the PERFECT buttercream every time. Personally, I like to increase the shortening to 3/4 cup and add a small splash of almond extract for extra flavor. To color it like a flower pot, I mixed in Wilton gel colors brown and copper. Another little tip, less is more. The buttercream tends to darken the longer it sits, so always go for a slightly lighter color than you want. STEP 8 – The hardest part of this project is frosting those cake pots. It’s a bit tricky but I found if make a “C” shape with my hand, holding the top and bottom, you can rotate the pot to frost it. Then place it on your serving dish and frost the top of the pot. To make them look like real flower pots, add a layer of crushed OREO cookies to the top of each pot. 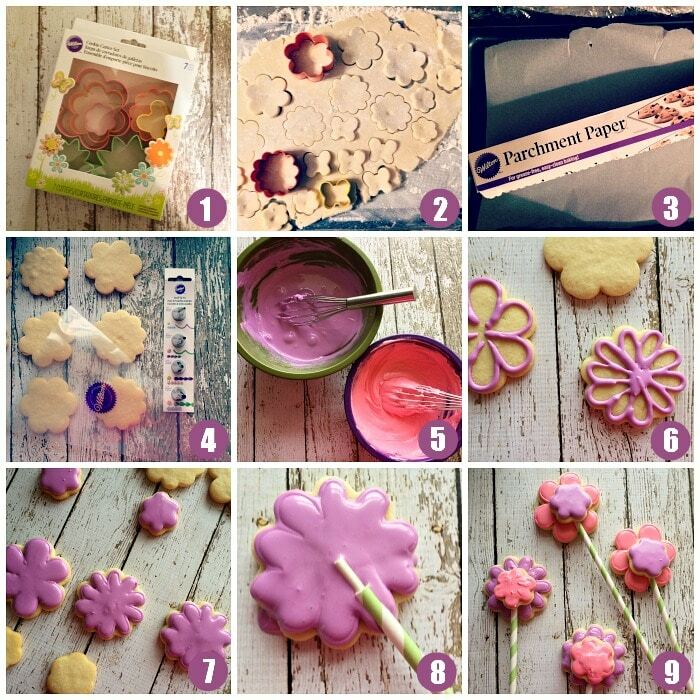 STEP 9 – Set your flower pot cakes up where you plan to serve them before inserting the flower cookie pops in the center! Prepare the sugar cookie dough and refrigerate in plastic wrap for a few hours before rolling. Preheat the oven to 375 degrees F. Use various sizes of the flower cookie cutters to cut the dough. Place the cookie cutouts on a parchment lined baking sheet, bake until done and cool on a wire rack for an hour. Once the cookies have cooled, it’s time to frost them. You’ll need Wilton disposable pastry bags and a small round Wilton decorating tip. You’ll need to make one batch of Wilton’s royal icing recipe, divide it between two bowls and color with Wilton gel color in pink and purple. Fill a pastry bag with the round tip and a few spoonfuls of purple icing. Outline half the large cookies and half the small cookies. Do the same with the pink icing. Thin out both icing colors with a little water so it that it flows like honey and pipe it inside the cookie outlines. Insert a Wilton treat stick inside a green paper straw and trim the straw to the same length as the stick. Press the stick into the center of the large cookie, top with a little extra icing and press the small cookie on top of the stick in the center of the large cookie. Set the cookies aside to harden for AT LEAST 4 HOURS. Overnight is even better. Gather the supplies you will need including the Wilton Flower Pot Cake Pan, Wilton Bake Easy non-stick spray and your favorite pound cake recipe. For this pan, it’s important you use a sturdy cake like a pound cake! While you can use the grease and flour method, I prefer the ease of the Wilton Bake Easy spray for coating my pans when I’m baking cakes. It’s super easy to spray on and keeps cakes from sticking to the pan. Go ahead and give your pan a spray and preheat the oven to the needed temperature. Prepare your pound cake recipe and divide it between the 6 cavities, filling each one just under the bottom rim of the flower pot “lip”, about 2/3 of the way full. Bake as directed. Cool the pan upright on a wire rack for 5 minutes. Cover the top of the pan with parchment paper and invert over a wire cooling rack. Leave the pan in place and allow it to cool for 10 minutes. Carefully lift the pan off the flower pot cakes and allow them to cool to room temperature before frosting. You can make a homemade buttercream ahead of time and refrigerate, just allow it to come to room temperature before using. For this project, I used Wilton’s buttercream recipe which some people find tricky to make. I assure you, follow this instruction video and you will have the PERFECT buttercream every time. Personally, I like to increase the shortening to 3/4 cup and add a small splash of almond extract for extra flavor. To color it like a flower pot, I mixed in Wilton gel colors brown and copper. Another little tip, less is more. The buttercream tends to darken the longer it sits, so always go for a slightly lighter color than you want. The hardest part of this project is frosting those cake pots. It’s a bit tricky but I found if make a “C” shape with my hand, holding the top and bottom, you can rotate the pot to frost it. Then place it on your serving dish and frost the top of the pot. To make them look like real flower pots, add a layer of crushed OREO cookies to the top of each pot. 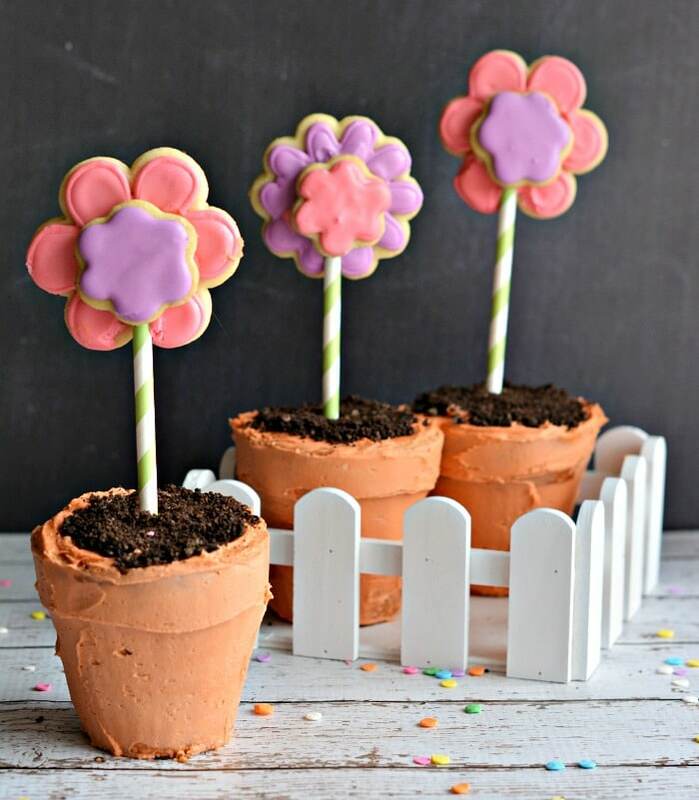 Set your flower pot cakes up where you plan to serve them before inserting the flower cookie pops in the center! Want another fun dessert tutorial? Try this Unicorn Fudge! Its beautiful rainbow layers can easily be customized to any color. Its SUCH a fun and striking dessert!